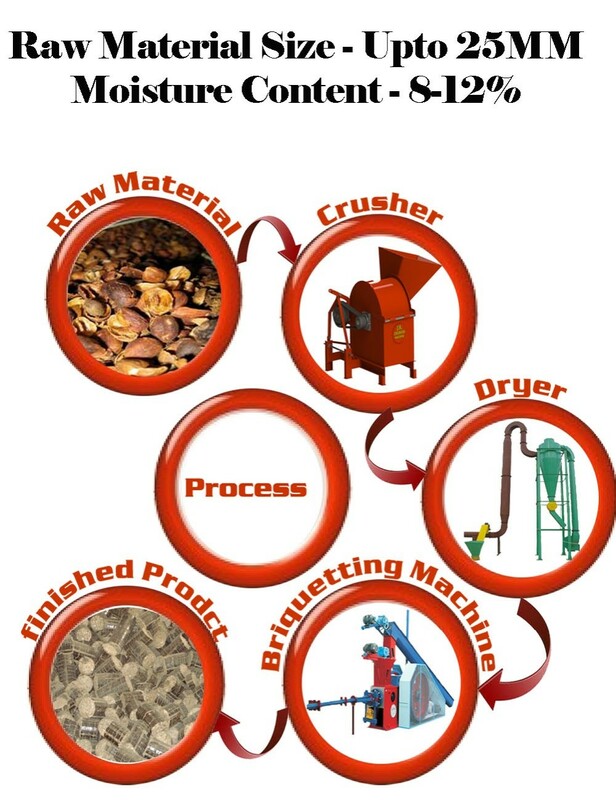 Biomass Briquetting is the process of converting low bulk density biomass into high density and energy concentrated fuel briquettes. Biomass Briquetting plants are of various sizes which converts biomass into solid fuels. Briquettes are ready substitute of Coal/wood in industrial boiler and brick kiln for thermal application. Biomass briquettes are Non conventional Source of energy, Renewable in nature, Eco friendly, non polluting and economical. Process of converting biomass to solid fuel is also non-polluting. No addition of any binder / chemicals is required so it is 100 % natural. Every year millions of tons of agricultural waste are generated. These are either non-used or burnt inefficiently in their loose form causing air pollution. Handling and transportation of these materials is difficult due to their low bulk density. These wastes can provide a renewable source of energy by converting into high-density fuel briquettes without addition of any binder. 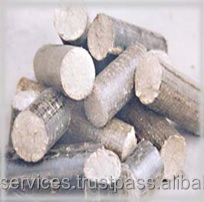 Briquettes have high specific density (1200 Kg/m3) and bulk density (800 Kg/m3) compared to 60 to 180 Kg/m3 of loose biomass. These can stand the ardors of long distance transport. Loading/unloading and transportation costs are much less and storage requirement is drastically reduced. Compared to fire wood or loose biomass, briquettes give much higher boiler efficiency because of low moisture and higher density. importance of these materials as alternate fuels has been well recognized for use in power generation. 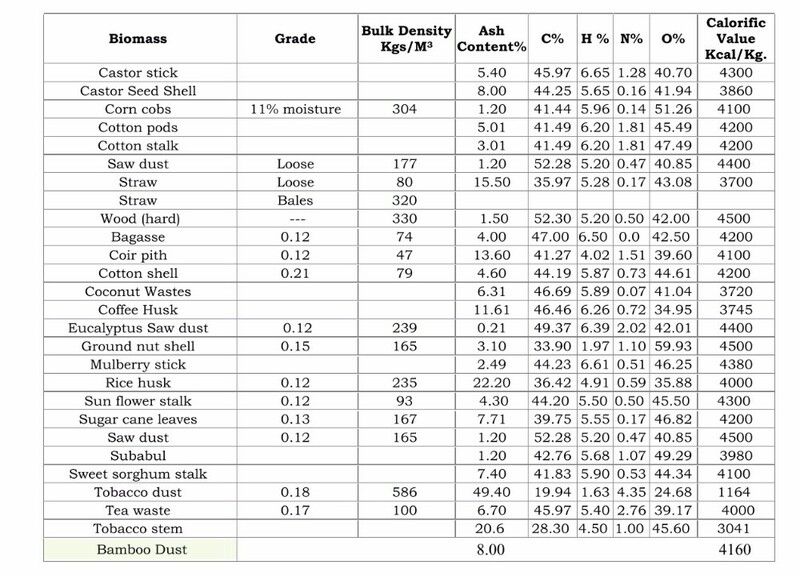 While the characteristics of biomass vary from different geographical regions, the values for typical biomass materials are indicated for general guidance. Please Note: Above biomass is suitable for using separately or in a mix form as an input of Raw Material for converting finished briquettes. Calorific value may very due to different quality of raw material.